Home > Employment Law > What Does a Sudden Disability Mean For Your Career? In 1990, the Americans with Disabilities Act (ADA) was passed by Congress with the intent to assist people who had disabilities to overcome barriers in society. The Act included equal access to employment, public facilities, public transportation, and more. Initially, the Supreme Court handed down an interpenetration of the ADA that was very narrow, so Congress acted and created the ADA Amendment Act (ADA-AA). This was passed in 2008 and enacted a variety of changes. It reversed many of the court’s decisions that had restricted the ADA in the past. The ADA Amendment Act was designed to enact a comprehensive national mandate to end disability discrimination, outlining standards that were clear and enforceable. This Amendment expanded the protections offered under ADA. The ADA only covers companies that have at least 15 employees. There are three ways disability is defined in the Act. These include “regarded as” disability, “actual” disability, and “record of” disability. An actual disability is defined as a physical or mental impairment that substantially limits one or more major life activities long-term. However, there is no specific definition of “substantially limits.” The definition of disability was meant to have a broad interpenetration. Under this definition, something like a broken leg would not be considered a disability and would not constitute the possibility of disability discrimination. 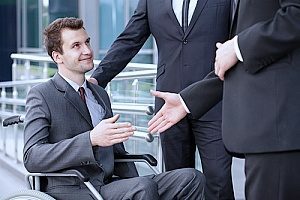 If you are returning to your job after facing a disability, you may be wondering what kinds of changes or actions you can reasonably request from your employer to make things easier for you. Under the ADA, a number of things are considered to be reasonable accommodations, eliminating disability discrimination. These can include things like modifying a work schedule as well as the use of leave, altering facilities to make them more accessible to the disabled, and reassignment to a vacant position. It can also include teleworking, medical leave, flexible work schedules, moving non-essential job responsibilities to other workers, incorporating breaks in between assignments to rest and recover, performing job duties from a seated position, utilizing lift devices, providing a sign-language interpreter during meetings, training sessions, and more. You should request these accommodations as soon as possible and not wait until your work performance suffers. Your employer is not required to retroactively forgive any performance problems. However, you don’t have to be specific about your needs as it is up to your employer to analyze the workplace, determine job functions and devise necessary accommodations. Employers do not have to make accommodations for “essential tasks.” For example, if you work for a package delivery company and are expected to be able to lift and handle heavy items, your employer does not have to guarantee your job. In these cases, you have the right to request being reassigned to a vacant position that you are qualified for. This could include things like managerial or administrative positions. When you are faced with a sudden disability, the best thing you can do to avoid disability discrimination is to get in communication with your employer as soon as possible. If you will be out of work for a long time it’s important to notify them, and if you’re going to need accommodations upon returning to work for things that may take longer for your employer to implement. If you’re dealing with a less serious injury like a broken bone, you should be very open with your employer about how exactly it will be affecting your work and any accommodations like having a desk raised that need to be made. If your disability has required you to find a new job, you may feel discouraged if you focus on all of the things you can’t do. Instead, you should focus on what you can do and help that guide your employment search. During an interview, you should explain how you’ll be able to accomplish tasks that may require of you with your disability. This could include things like letting them know you can attend meetings or move around the office as much as necessary so long as there is ample room to maneuver your wheelchair. You shouldn’t disclose your disability right away, but rather wait until it needs to be addressed in regards to your ability to do something. What you want to do is state your disability, any accommodations you may need, and how with some accommodations your disability will not affect your ability to do the job. It’s important that you are confident about your ability to get the job done as this will make the employer feel better about hiring you. You also shouldn’t spend to much time on your disability and how it limits you, but rather steer the course of the conversation to focus on all of your skills and talent to highlight how you can be a valuable employee. If you have experienced disability discrimination for a job you are interested in or working in, reach out to an employment law attorney for more information about your potential case.